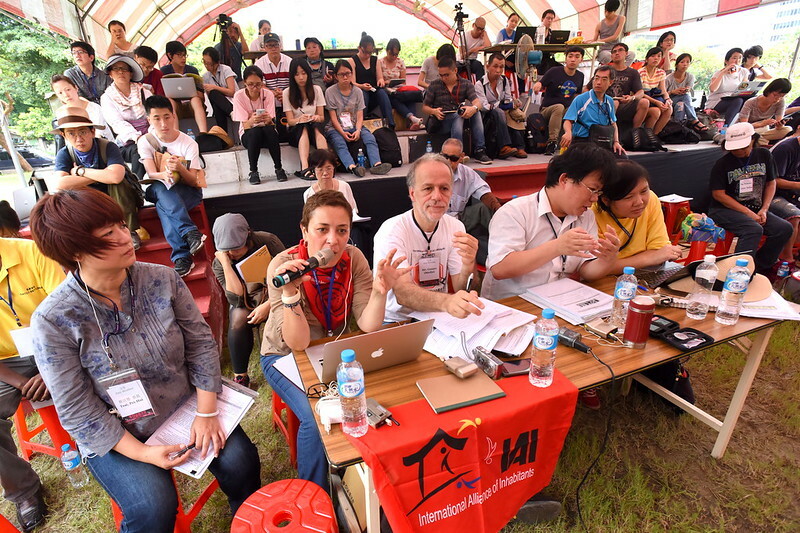 From 2nd – 4th July, about 100 people gathered in Taipei, Taiwan’s capital city, to participate in the East Asia Regional Tribunal on Evictions. Representatives from Taiwan, Japan, South Korea, Malaysia, Thailand, Hong Kong and the Philippines attended and presentations about cases of forced displacement were made before a panel of five jurors. Taoyuan Aerotropolis, a massive planned development around Taoyuan Airport, Taiwan’s main airport on the outskirts of Taipei, was one of the eviction cases presented. Most of the 3,700 hectares of land earmarked for expropriation for the aerotropolis is fertile farmland and 46,000 people face loss of their homes and farmland. Other eviction cases highlighted at the ITE-EA included: informal settlements in Taipei; eviction of Shinjuku Kasumigaoka-cho public housing complex under the Olympic 2020 Stadium Project in Tokyo; the Yongsan Tragedy in Seoul; eviction of rooftop tenants in Hong Kong, the 25 year struggle of the Pom Mahakan community in Bangkok; the Kampung Gatco community in Sembilan, Malaysia and the Sitio San Roque case in Quezon, the Philippines. The ITE East Asia meeting was part of preparations for the fifth International Tribunal on Eviction (ITE) session, which is slated to be held in mid-October in Quito, Ecuador as part of the United Nations Habitat III conference on housing and sustainable urban development. Fittingly, the first day of the tribunal was held at the former site of the Huaguang community, in the heart of Taipei, where a disadvantaged neighbourhood was demolished in 2013 in to make way for an upmarket development. The government defined people who had been living in the Huanguang community for decades as ‘illegal residents’ and pressured them to leave by imposing fines and lawsuits on them. Forced evictions began without a relocation plan, leaving many residents homeless. Ketty Chen, a political scientist and academic, has posted a moving account of a two-day protest, by residents and supporters, attempting to block excavators from entering the site for the fourth wave of evictions. 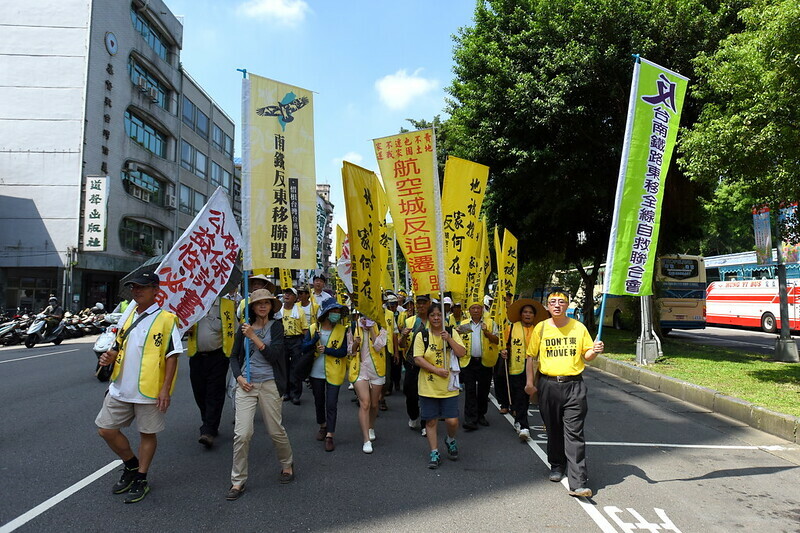 On the final day of the ITE East Asia tribunal event, on Monday 4th July, more than 200 people marched through Taipei to the Presidential Office to protest forced evictions. The route of the march, beginning at the site of the former Huaguang community, is shown here. Along the way they stopped outside the Transportation Ministry to protest the Taoyuan Aerotropolis, the Tainan underground rail plan and other land expropriation projects. The draft recommendations of the tribunal showed that the number of people affected by forced eviction in the cases that had been considered added up to a total of nearly 1 million. As they marched through Taipei demonstrators demanded that the government initiate discussions on housing rights, pay special attention to eviction cases nationwide and adopt recommendations passed at the International Tribunal on Evictions’ (ITE) meeting. Some of the protesters threw shoes at signs, an expression of anger that the Presidential Office, claiming a full schedule, refused to send representatives to meet with them. More photos of the march have been posted by the Taiwan Alliance of Anti-Forced Eviction. In May 2016 several legal academics pointed out legal flaws in the proposed hearing procedures for land expropriation for Taoyuan Aerotropolis, expressing doubts over provision of information to residents in order for them to exercise their rights, and whether their opinions would be incorporated in the decision-making process. A few days before presenting the Taoyuan Aerotropolis case at the evictions tribunal, on 21st June, groups opposing the project requested that the government stop land expropriation and review the Environmental Impact Assessment of the planned third runway, which is integral to the project. Land expropriation for the new runway would entail the forced relocation of 20,000 people. 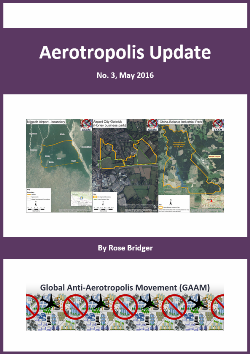 The third runway also raises safety and environmental concerns. The site is exposed to strong winds and its location, close to the sea with soft, sandy soil, would require extensive land filling operations in order to bear the weight of aircraft. The proposed third runway location poses a risk of bird strikes and is very close to a fuel depot holding up to 130,000 kilolitres of fuel. Opponents of Taoyuan Aerotropolis have accused authorities of circumventing the law by proceeding with the land expropriation for the third runway, and beginning construction of basic infrastructure, before completion of an Environmental Impact Assessment (EIA). 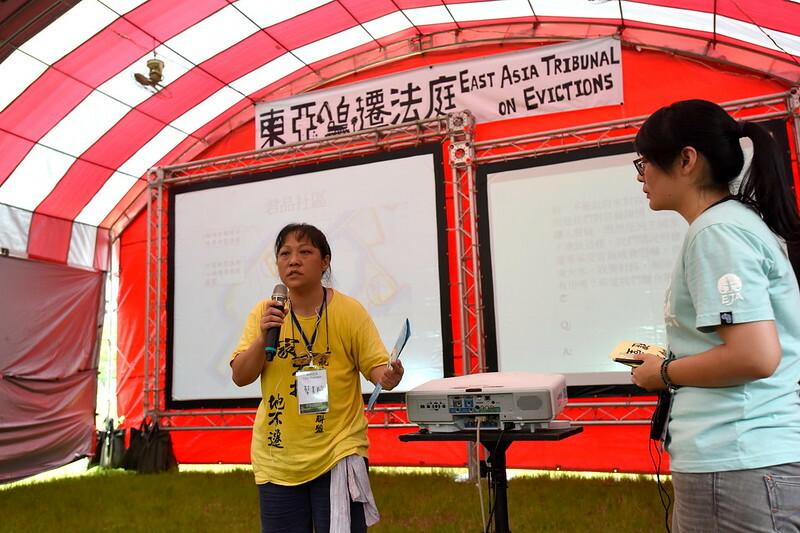 Video recordings of the East Asia Regional Tribunal on Evictions have been published online, with some sections translated into English. Presentation and discussion of the Taoyuan Aerotropolis case is in the first recording beginning at 1 minute 39 seconds. Unfortunately translation into English is not audible for most of this segment. A second section of the event recording is available here.